School starts in 3 weeks at our house, and we are going to have to adjust to our first child being in school all day every day. Part of the back to school routine means that I’ll be making packed lunches again, and when you have picky eaters it tends to get frustrating fast! That’s why I was excited to learn that Land O’ Frost recently came out with these awesome Wrap Kits. Wraps happen to be one of the few things my 6 year old WILL eat. 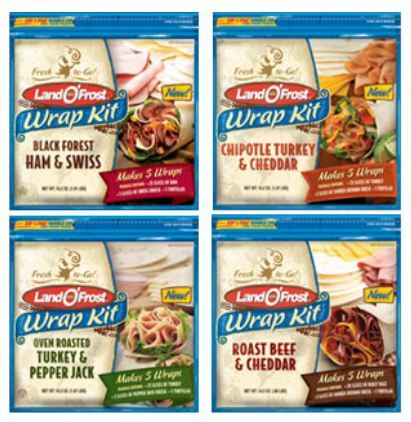 Each Land O’ Frost Wrap Kit comes with 5 tortillas, 5 slices of cheese and 25 slices of lunchmeat – which would more than feed my child (or husband for that matter) for an entire week! These wrap kits are also going to be awesome when we have to eat on the run on our way to gymnastics or soccer, or when we decide to have a picnic at the park. Right now you can request a $1 Land O’ Frost Wrap Kits Coupon here, while supplies last. Do you want to purchase a Land O’ Frost Wrap Kit to try for yourself? Find a store near you here. Learn more about Land O’ Frost on Facebook or Twitter. Land O’ Frost wants to hook you up just in time for back to school! 1 lucky winner is going to receive 15 FREE Wrap Kit Coupons! Because each kit can make 5 wraps, that is 25 lunches worth of food – which is basically a month worth of free lunches. Pretty awesome! This post sponsored by Land O Frost as part of the Win Giveaways 2012 Back to School Giveaway Bash. This post was written by me and was not edited by the sponsor. Read more in my disclosure policy. Find more information on the terms for this giveaway on the Win Giveaways Facebook page. Turkey and pepper jack for my family. Would love these for my 4 kids lunches!!! I love carrot sticks and apples in my lunches! and I signed up to receive the email! A sandwich is always a good lunch staple…and always better accompanied by chips! Cold fried chicken and homemade potato salad with pecan pie for dessert! My favorite lunch is a ham sandwich and potato chips! ham sandwich, grapes and sun chips. lunch-turkey/salami deli sandwich, cheetos, fruit roll-up, granola bar, and some lemonade! My favorite sack lunch is a turkey sandwich with a little bag of chips and something sweet – a snack bar or a mini candy bar or a couple cookies. Yum! I’m a Stretching a Buck email subscriber! I good sandwich, fruit, and chips! Already liked you on FB. Posted and Shared this giveaway on FB. I like Stretching a Buck on FB (AMW Hammon). The black forest ham and swiss looks great! A turkey sandwich, grapes or an apple, chips, and some kind of dessert. I would love to win this for my kid’s school lunches! My favorite packed lunch is a sandwich, salad, fruit & water. I mostly take leftovers for lunch. My favorite packed lunch is wraps, lol. My daughter and I love them. Smoked ham and Swiss on Rye.. yum! Favorite packed lunch contains sandwich of ham on rye bread with mayo and cheddar cheese, chips and apple. My favorite packed lunch honestly, is leftovers from dinner the night before. Love to put in frozen gogurts! I am old school. I still love a sandwich chips a pickle and a cookie. There is actually a lunch place here in town called “Mama’s Sack Lunches” they serve sandwiches All in a brown bag just like when you were in school.with a pickle a small bag of chips and aple and a Hershey’s Kiss. I am also an email suscriber. Yum! Turkey & Jack would be a favorite around my house. We love wraps at our house, too. Sometimes we make them with a bit of chicken, lettuce, shredded cheese and salsa, which is very yummy. And PB&J are always a good fall-back. It is hard to think of different things so that we won’t burn out on the same lunches. These wraps are a great idea…especially all of the flavors! I eat a larger breakfast and dinner so I like a lighter lunch – typically a salad or sandwich. My favorite packed lunch would be a sandwich and yogurt with a side of fruit and chips. My favorite packed lunch contains pretzel crisps and hummus or a PB/J sandwich. They never get old! Chipotle Turkey & Cheddar – YUM! Bread, turkey, cheese and pickles! Peanut butter and jelly sandwich along with some chips and a piece of fruit. I like a sandwich, chip and fruit. I also love to take leftovers. Turkey and tomato sandwhich with peanut butter and crackers! I love taking leftovers for lunch! A sandwich, apple, cookies, and juice! Turkey and cheese wraps… Would looove to have it all come in one easy package! Turkey on wheat with swiss cheese and tons of veggies. I know I should pack carrot sticks or some other healthy stuff but I usually eat chips and drink a soda with my lunch. Our packed lunches usually consists of; a sandwich, chips, fruit cup, and a sweet treat (pudding, brownie, etc). My favorite packed lunch is a ham and cheese sandwich, Ritz crackers, and an orange. I always try to pack fresh fruit if I can. The chipotle turkey sounds great. My favorite packed lunch includes: tuna salad w/celery and onions, somthing crunchy like an apple or carrot sticks or both, something chocolate – maybe Hershey’s kisses, yogurt or cottage cheese, a banana or some canned sliced peaches in a tupperware container, whatever planned overs I have laying around in the fridge. I’d love a good turkey club sandwich and some potato chips. I love turkey, ham and sliced cheddar cheese and lettuce on 1/4 of piece of french bread….yum and a bottle of water that i add my own flavor. My kids usually get a sandwich, cheese stick, and fruit. These wraps would be awesome for lunch! A turkey, lettuce, cheese, and bacon wrap! I want to try that black forest ham & swiss for my lunch. My daughter and son would like to try the Chipotle Turkey & Cheddar wrap in their lunches. My favorite lunch is a sandwich, carrots, fruit and a cookie. My favorite lunch is a sandwich, chips, fruit and maybe a cookie! Ham and cheese sandwich, chips, and fruit. We like chicken fingers, chips and fruit snacks! ham sandwich, carrots, and an oreo cookie! My favorite lunch is a sandwich or wrap with fruit and a modest helping of chips or puffs. My favorite packed lunch is a sandwich, fruit and cookie. Some kind of baked chips are always a hit in my kids lunch box. Carrots with lite ranch dressing. My favorite lunch includes fresh fruit and something sweet (preferably with chocolate). I love sandwiches and I love Land O’Frost meats. I’m hoping to win because both of my kids prefer to bring lunch from home instead of eating the school lunches. Thanks for the giveaway! I like your , fruit, and a sandwich. I like you on facebook, My comment 2 up should read yogurt, not your! I love a ham or chicken salad sandwich and some chips. I like the roast beef and cheddar. chicken salad sandwich with fruit and veggie. This would make lunch packing time a whole lot easier! My favorite packed lunch is leftovers, particularly yummy pasta. My kids are always excited with yogurt in their lunch. But they still eat sandwiches every day without complaint! Favorite lunch is a sanwich and carrots wth dip. My favorite packed lunch has a wrap, a fruit, a drink, something crunchy (like pretzels) and some small sweet treat!